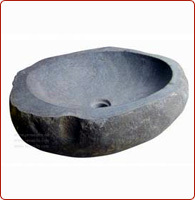 We can also supply Stone handicrafts in various sizes and specifications to fulfill individual customer requirements. Each stone is unique in its character and properties and hence variation must be expected. 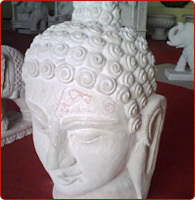 The given pictures are for reference only and the actual Stone handicrafts may vary in color, tone, marking and texture. 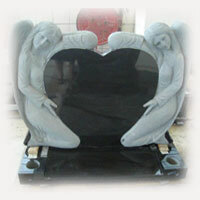 Finishes Natural, Honed, Polished, Chisel, Bush Hammer, Sandblasted, Mosaic, Lethstone etc. 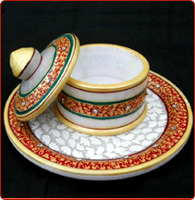 Many many available finishes as per customer requirement. Our collection of marble inlay products consists of marble inlay tabletop, marble inlay floor and marble inlay tile, all carved to ultimate perfection. The exquisite range of marble tabletop are embellished by some of the finest artisans from different parts of the country. The aesthetic engravings you see on them are results of hours of painstaking hard work put by them. elegant range of marble inlay products, which comes in snazzy designs and luscious colors to suit well with the decor of interior as well as exterior. 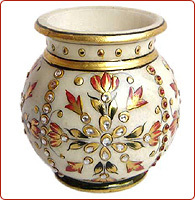 These products are aesthetically carved to excellence to radiate a delicate charisma in the ambiance. 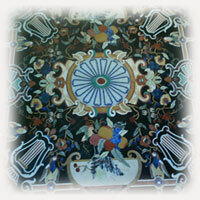 Our range includes marble inlay panel, marble inlay tiles, marble inlay floor, decorative marble border etc. The astonishing variety of semi precious stone tiles depicted here offer an astonishing bonanza for the buyers full of finer details. The stones are available in heterogeneous colors & styles. While some of them are a burst of vibrant hues others exude a serene & artistic appeal, all specially made to give your home a look you will cherish. We manufacture semi precious table tops, semi precious tiles, semi precious borders etc and export them at pocket friendly prices. A plethora of innovative and antique architectural ornaments that include fine craftsmanship and fine trelliswork that reflects garden structures beautifully and elegantly. 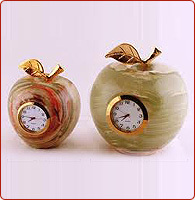 These classy & artistic looking ornaments will endow a regal charm on your green patch. Apart from garden these can be added to many other portions of your house to act embellishments. 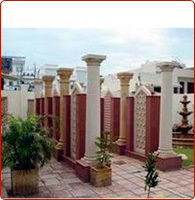 Our exotic collection encompasses decorative stone balustrades, hand carved stone columns, stone carved panel etc. Avail from us highly durable and magnificent architectural ornament products, that are bound to add a royal charm to your residential and commercial buildings in an exclusive manner. These products are adroitly & fascinatingly engraved with painstaking attention to minutest details. We offer stone railings, stone balustrade, stone carved pedestals, stone screens, stone door surround, marble window surround etc. Bring a contemporary beauty in the surroundings of your luxurious villa, by installing these stone screens and stone jalis, which epitomize the glorious and exquisite craftsmanship of our workers. Chiseled out from the block of single stone, these stone screens and jalis contain multiple artistic & alluring designs. 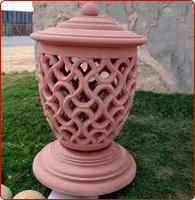 Our range includes carved marble screen, carved stone jali and many. To bring an aura of art, beauty and fashion in your interior, G.S. Marbles has brought for you a comprehensive range of interior ornament marble artifacts, which have capacity to appeal the senses of everyone through their imaginatively and adeptly etched eye catching designs. 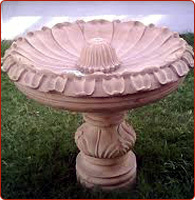 We offer marble wash basin, hand carved marble vase etc. Complimenting all type of interior settings, our interior ornament marble handicrafts are engraved in multitude of traditional and contemporary styles and shapes. Our diligent sculpturers have expressed their aesthetic feelings with chisel and hammers by carving innovative patterns on these products. Our range includes marble table base, marble stone fire place, marble fruit bowls, stone fruit basket, marble pedestals, stone console table and many more. 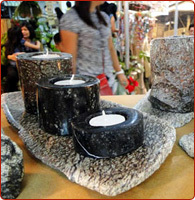 Make your garden more elegant by placing our marble products amongst green plants & blooming flowers. Assiduously carved using high creativity and artistic expertise, our garden ornament products suit well with the nature of your garden. 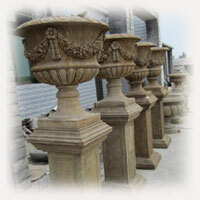 We present marble garden fountain, stone fish fountains, lady fountain, carved marble fountain, garden wall fountain etc. Beautified using skillful sandblasting process, our extremely striking sandblasting products have etched a reputed place in the heart of our esteemed clients all over the world. We are one of the eminent manufacturers, wholesale suppliers and exporters of an enchanting array of sandblasted products, which includes sandblasting border, sandblasting tiles, sandblasting table tops and many more. Stone Handicrafts are used as decorative landscaping stones and come in various hues and sizes and find usage in homes, artificial ponds, fountains, posh lounges, open air theaters, aquaria, parks, out houses, interior, exteriors and gardens. Stone handicrafts are used at a large scale for various interior designing purposes due to their fireproof nature and low maintenance cost.